Ex head of the World Health Organisation warns on mobile phone usage. 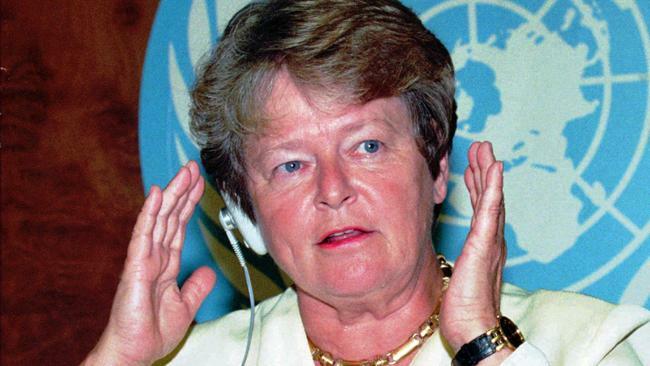 One of the world’s most respected people – a leader in sustainability, a peacemaker, 3 times prime minister of Norway – Gro Harlem Bruntland has hinted before that she experiences symptoms of electrosensitivity – but in a recent inetrview has clearly stated that she immediatley gets headaches if she puts a mobile phone to her head. Ex-WHO General-Director and Ex-Prime Minister of Norway: Wireless Technology Has Negative Health Effects. There Is No Doubt. On Friday the 14th of August 2015, retired WHO General-Director and Prime Minister of Norway, Dr. Gro Harlem Brundtland, was interviewed by the Norwegian newspaper Aftenposten*. One of the issues raised in the interview was her current thoughts on wireless radiation. Her statement was crystal clear. Watch the relevant clip from the interview here, subtitled in English by Citizens’ Radiation Protection, Norway. We are grateful to Gro, for her clear and honest response.